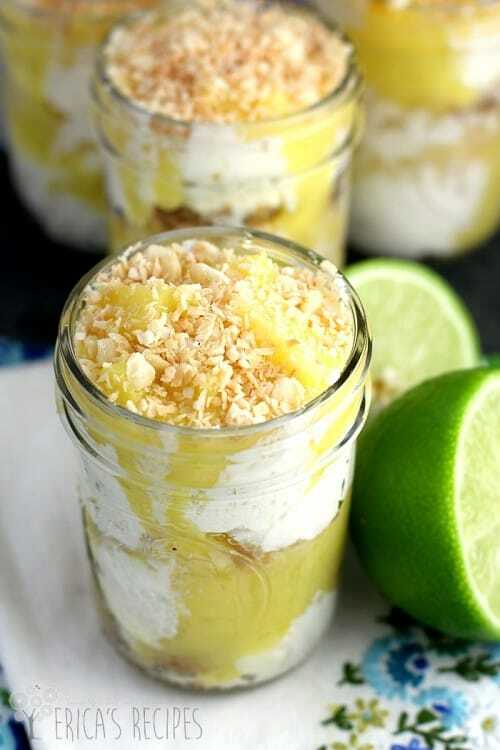 This layered dessert uses fresh Lime Curd, pineapple, Macadamia nuts, and toasted coconut layered with bits of EDWARDS® Triple Coconut Crème Pie as a kitchen hack to give you a beautiful treat worthy of your Easter table or holiday spread. 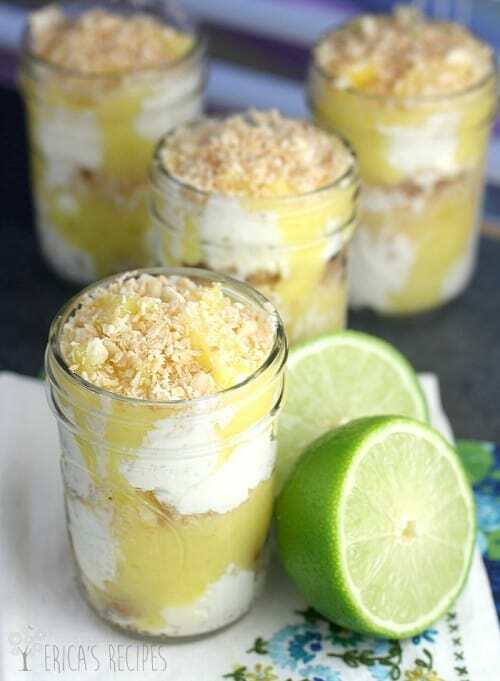 Assemble Easy Individual Tropical Trifles in advance in individual mason jars for easy service. Okay, so I took a little liberty with the title …since I did not use any cake. So, technically not a trifle… but this dessert is everything else. 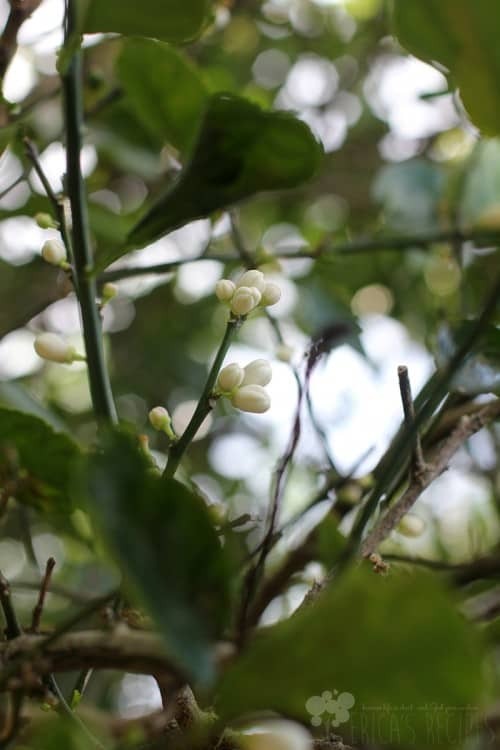 It is lucious and tart and dreamy and coconutty (but, not too much) with a subtle crunch. All the feels. And I served it in little mason jars. Because I’m a food blogger and we do stuff like that. Guys, this dessert. After I took these photos and started eating, I don’t remember stopping. This is so divine! The fresh Lime Curd – well, I am just going to start smearing that on everything in my life. 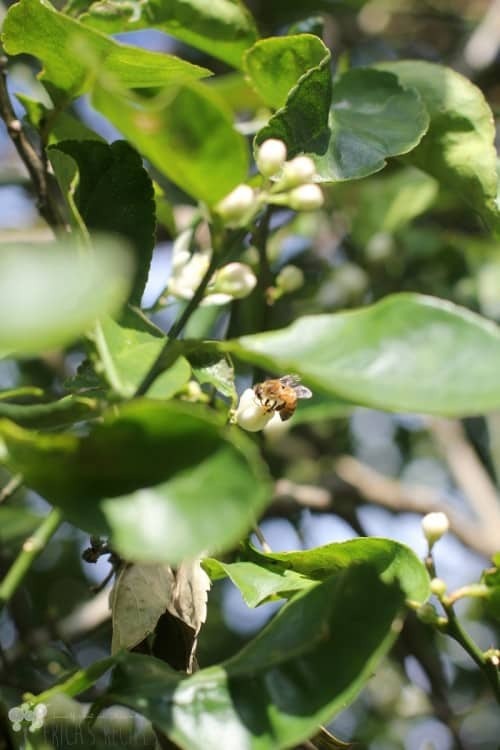 It is tangy and sweet, but not too much of either. I have never made curd before, but it was easy. So completely worth it. I chose to layer the “fix-ins” with little scooped bits of pie. I have had Edwards pies before – the Hershey’s Chocolate Crème Pie is insanely good. This was my first time with the Triple Coconut and I loved it. I am not a fan of things that are too coconutty, you know what I mean? This was just right, and with a cookie crust and layered with other fresh ingredients this tasted completely homemade. So think of this recipe as a base for all kinds of other possibilities year-round. You could use different fruit and nuts. You could use different pies. 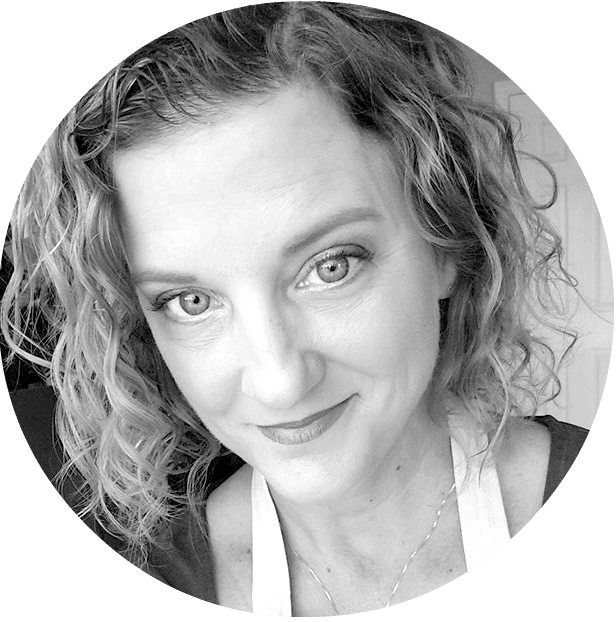 Mrs. Smith’s makes a whole assortment of fruit pies that could also be used in a dessert like this too (such as replace lemon juice for the lime for the curd, then layer with Mrs. Smith’s® Blackberry Cobbler, nuts, and berries). So that’s it kids! Make this one! 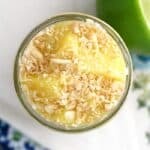 With the Edwards pie hack and just minutes to make the lime curd, this easy dessert is perfect for any occasion or as a way to treat your family for no reason at all. This layered dessert uses a kitchen hack to give you an easy but beautiful treat worthy of any occasion. 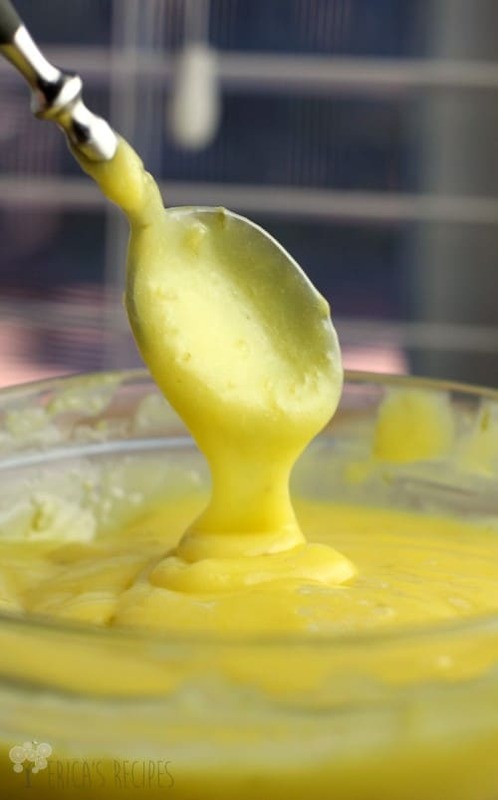 For the Lime Curd, put all the ingredients for the curd except the butter in a medium sauce pan. Turn burner to medium-high heat, and heat, stirring constantly, for ~5min until mixture thickens and coats the back of a wooden spoon. Remove from the heat, and whisk in the bitter, 1 tablespoon at a time. Put in the fridge to set overnight. Alternatively, put in the freezer 20 minutes, stir, then let set in the fridge for 2 hours. 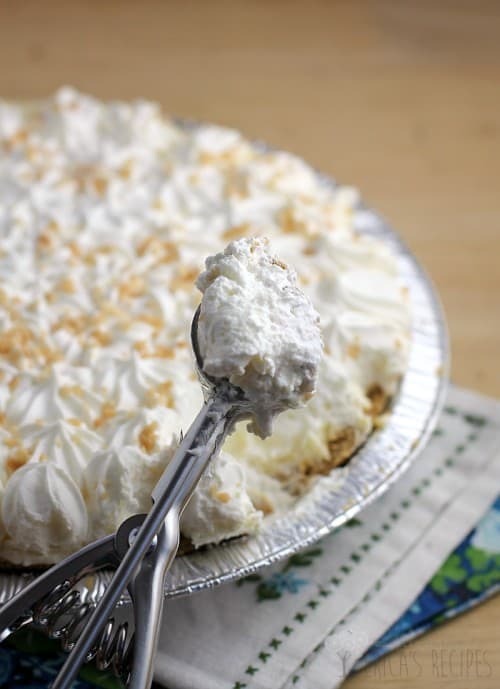 To assemble the desserts, using a melon baller or small ice cream scoop, scoop 4-5 balls of EDWARDS® Triple Coconut Crème Pie into 8 mason jars. 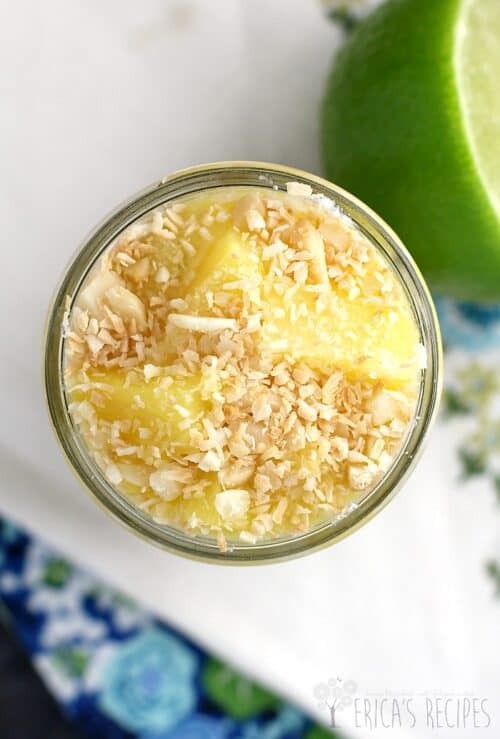 Layer a good sprinkling of Lime Curd, macadamia nuts, and pineapple. Repeat. Top off with the toasted coconut. Yields 8 servings. Leave me a comment! What yummy dessert are you planning for Easter? I love the flavors in this trifle and you added pie. Wow wee! OMG…drooling here. First of all jealous of 1. Florida, 2. Garden, 3. Green, 4. Lime tree…lol Seriously though, this is just genius! 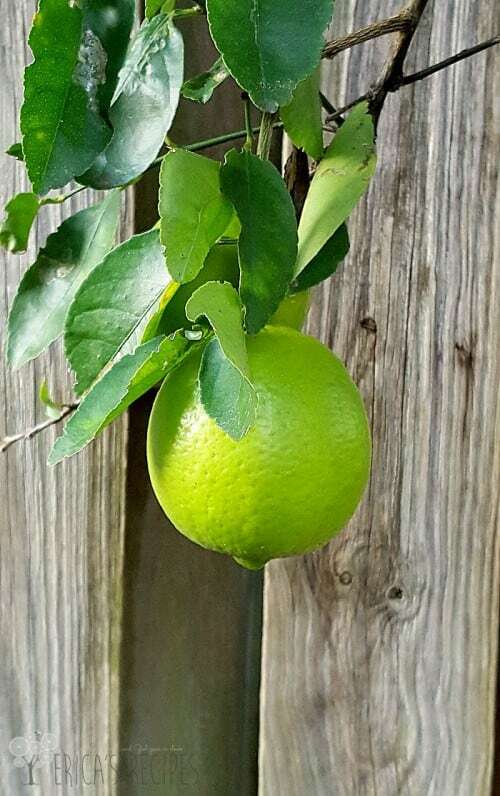 Okay, so I am totally jealous that you have a lime tree in your backyard! I want a lime tree, lol. 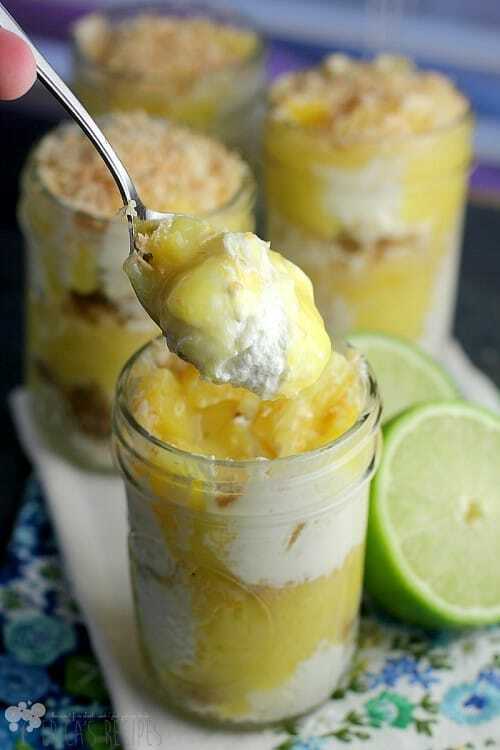 😉 And this trifle looks and sounds amazing- LOVE the creamy coconut with the tart lime. I love this tropical dessert. Such a creative idea!